The innovative TI-58 was the perfect base for a lot of customized calculators. The idea behind these products was the novelty of the Solid State Software Modules™ with up to 5000 program steps. The incotax application was developed by the Bureau of National Affairs, Inc., Washington D.C. to calculate Federal Income Taxes and distributed by Warren, Gorham & Lamont, Valhalla NY (WG&L). Dismantling the tax planner calculator reveals a standard TI-58C calculator manufactured in February 1981. 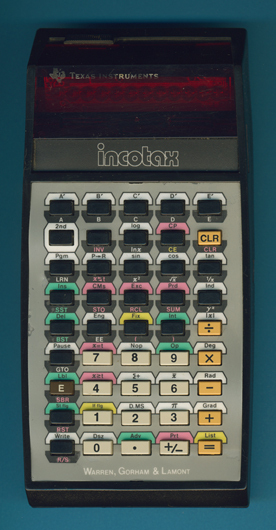 Don't miss the 82' edition of the WG&L incotax calculator and the WG&L incotax 1985 calculator sporting an external program module. Warren, Gorham & Lamont, Valhalla NY was founded in the 1950s, but traces its roots back to 1882, when Willard Warren started a weekly, the Connecticut Real Estate Record and Building News (later and still today, The Commercial Record). The Thomson Corporation acquired Warren, Gorham & Lamont (WG&L) in 1980. For more than three decades, WG&L was a major information source for finance professionals in companies of all sizes and industries. The WG&L product line includes some of the most valued newsletters, journals and treatises in the legal, tax and accounting fields. WG&L remains one of the most respected brands in the industry. In 1996, the tax publishing activities of Warren, Gorham & Lamont were merged with RIA. WG&L ® is a trademark of Warren, Gorham & Lamont, Valhalla NY. © Joerg Woerner, February 8, 2010. No reprints without written permission.